The other day I visited our local county museum and found one of my favorite “read to the kids” books. A retrospective journey through the career of Simms Taback filled half of the large room. Poster size book and magazine covers decorated the walls, mounds of his books sat up on shelves, and his amazing “Joseph” coat stood upright in the center of the room among many other wonderful surprises. You may not recognize the authors name but I’m sure you’ve read one or more of his books to your children, watched his work on the Children’s Television Workshop, or have seen his cover illustrations on Scholastic Magazine. Simms Taback grew up in a Bronx cooperative housing project of mainly Jewish immigrants. During his writing career he became an advocate for artist rights. His bold colorful and textured collage like illustrations contained hidden surprises, beautiful details and reflected his neighborhood, culture, language and experiences. The lyrical quality of his words along with his beautiful illustrations made his books stand out. It is no wonder that two of his books received the Caldecott Awards for illustrations in 1998 and 2000. Besides books and covers of magazines, his work extended to the design of the original McDonald’s “Happy Meal,” container in 1977. From New York, Simms Taback moved to Ventura County in 2007. He passed away on December 25, 2011 from pancreatic cancer. A couple of weeks before he passed away he attended the opening reception of the exhibit. I would like to imagine that he felt the warmth, admiration, and love for his books from the guests. 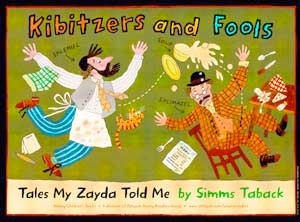 The “Simms Taback: Making Pictures for Children,” retrospective runs until February 12, 2012 at the Ventura County Museum. Cool! I learned something today. Normally I don't like sound on blogs but LOVE this song. Thanks Diana-don't know which song you landed on but glad you liked it.